The Greatest Movie ever rolled is Doug Bensons follow up to his 2007 documentary Super High Me. Both films have titles inspired/lifted from Morgan Spurlock documentaries, Greatest Movie Ever Sold and Super-Size Me. 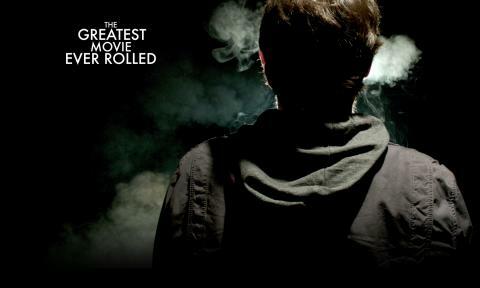 While Super High Me took the concept of Super-Size Me and replaced McDonalds with marijuana, Greatest Movie Ever Rolled takes the concept of Greatest Movie Ever Sold and replaces corporate sponsorship with a stand up tour… sort of. This is really just a film about life on the road with Doug Benson and Graham Elwood. This is not a sober examination of the isolation and depression that make up the life of a road comic and despite the title this is not a stoner movie either. GMER is a lean 80 minutes of hilarious interaction between Doug and Graham. The movie shows our protagonists trying to sell tickets, getting high with fans, traveling from gig to gig and promoting a show on morning television; more or less what you would expect to see in a movie that chronicles Doug Benson’s life on the road. The thing that makes this film unique and worthy of your time is how naturally funny Doug and Graham are with one another. They have great chemistry and are clearly close friends outside this tour. While the film appears to have been shot on DSLR and GoPro cameras it looks just fine. I’m not sure how many people who are watching this movie would have enjoyed it more if it had a more cinematic feel but I really enjoyed the guerilla style filmmaking that allowed for improvised moments and an overall feeling of authenticity. It’s not glossy but neither are its subjects. The only reason I mention this is because I’ve seen a couple of reviews that took the time to mention that the film looked cheap or unprofessional. So, in response, I wanted to take a moment to say the look of this film in no way lessens the experience and in fact I would argue that it adds to the film. Doug Benson and Graham Elwood are both touring comics who host successful podcasts that focus on movies. Doug Loves Movies is a movie trivia show while Grahams Comedy Film Nerds is more of a movie review/news show. These are two men who have a deep appreciation of film and it shows throughout. I would highly recommend this documentary to anyone with an interest in stand-up comedy.